French and U.S. coalition forces conducted a live and simulated close air support (CAS) exercise in Arta, Djibouti, between January 31 and February 4. 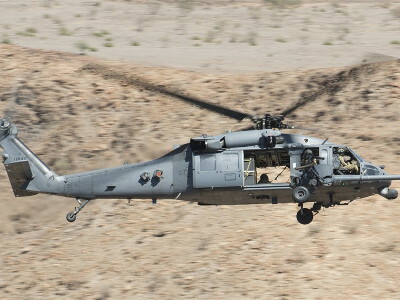 The five-day event involved the U.S. 24th Marine Expeditionary Unit and the French 3rd Marine Artillery Regiment joint terminal attack controllers guiding U.S. Air Force HH-60 Pave Hawks and French Air Force Rafale-M multirole combat fighters to specified targets during the day and night CAS exercise. “This is the first significant stop that we’ve made, conducting a live firing exercise in coordination with the U.S., preparing the French Naval Air Arm pilots for upcoming operations,” said Lt. Cmdr. Ian Sloan, British Royal Navy exchange pilot to the French Naval Air Arm. To increase partner nation interoperability, each exercise day was separated into three sections with two aircraft guided by both nations’ JTACs (Joint Terminal Attack Controllers), illustrating the different operating conditions they may encounter in future operations. These exercises introduced both military partners to integrating and refining work tactics for time-sensitive procedures, Combined Joint Task Force – Horn of Africa (CJTF-HOA) said. A JTAC instructor evaluated the teams in locating targets on different terrain and communication skills between one another. This exercise ensured that all aerial munitions called in by coalition JTACs and delivered by both nations’ aircraft were on target and on time. According to Sloan, it is easy to conduct training inside your comfort zone when you are doing it in a familiar environment. However, working with coalition nations using different languages and procedures, in unfamiliar terrain, is when the real benefits come out of the training/exercise/event. English was the designated language for both U.S. and French forces, their conduct of all CAS missions became successful by working through the language barriers and completing specific directions that are unique to each country. Communication challenges included different military language being used over the radio from both nations and the available light. By the end of the exercise, both JTAC parties gained valuable experiences by working through friction points during the exercise, in turn helping strengthen relations and improving security amongst participating partner nations. The 24th MEU is currently embarked on the ships of the Iwo Jima Amphibious Ready Group and deployed to maintain regional security in the U.S. 5th Fleet area of operations.